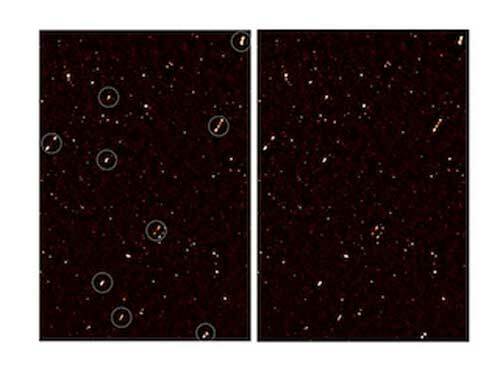 (Nanowerk News) Deep radio imaging by researchers in the University of Cape Town and University of the Western Cape, in South Africa, has revealed that supermassive black holes in a region of the distant universe are all spinning out radio jets in the same direction – most likely a result of primordial mass fluctuations in the early universe. The astronomers publish their results in a new paper in Monthly Notices of the Royal Astronomical Society ("Alignments of Radio Galaxies in Deep Radio Imaging of ELAIS N1"). The new result is the discovery – for the first time – of an alignment of the jets of galaxies over a large volume of space, a finding made possible by a three-year deep radio imaging survey of the radio waves coming from a region called ELAIS-N1 using the Giant Metrewave Radio Telescope (GMRT). The jets are produced by the supermassive black holes at the centres of these galaxies, and the only way for this alignment to exist is if supermassive black holes are all spinning in the same direction, says Prof Andrew Russ Taylor, joint UWC/UCT SKA Chair, Director of the recently-launched Inter-University Institute for Data Intensive Astronomy, and principal author of the MNRAS study. “Since these black holes don’t know about each other, or have any way of exchanging information or influencing each other directly over such vast scales, this spin alignment must have occurred during the formation of the galaxies in the early universe,” he notes. This implies that there is a coherent spin in the structure of this volume of space that was formed from the primordial mass fluctuations that seeded the creation of the large-scale structure of the universe. With study co-author – and UCT PhD student currently working at the National Radio Astronomy Observatory, Socorro, New Mexico, USA – Preshanth Jagannathan, the team discovered the alignment after the initial image had been made. Within the large-scale structure, there were regions where the spin axes of galaxies lined up. The finding wasn’t planned for: the initial investigation was to explore the faintest radio sources in the universe, using the best available telescopes – a first view into the kind of universe that will be revealed by the South African MeerKAT radio telescope and the Square Kilometre Array (SKA), the world’s most powerful radio telescope and one of the biggest scientific instruments ever devised. Earlier observational studies had previously detected deviations from uniformity (so-called isotropy) in the orientations of galaxies. But these sensitive radio images offer a first opportunity to use jets to reveal alignments of galaxies on physical scales of up to 100 Mpc. And measurements from the total intensity radio emission of galaxy jets have the advantage of not being affected by effects such as scattering, extinction and Faraday Radiation, which may be an issue for other studies. The presence of alignments and certain preferred orientations can shed light on the orientation and evolution of the galaxies, in relation to large-scale structures, and the motions in the primordial matter fluctuations that gave rise to the structure of the Universe. So what could these large-scale environmental influences during galaxy formation or evolution have been? There are several options: cosmic magnetic fields; fields associated with exotic particles (axions); and cosmic strings are only some of the possible candidates that could create an alignment in galaxies even on scales larger than galaxy clusters. The authors go on to note it would be interesting to compare this with predictions of angular momentum structure from universe simulations. It’s a mystery, and it’s going to take a while for technology and theory alike to catch up. Such projects are already in the planning stages; the SKA for example, and its precursor telescopes, the South African MeerKAT array and the Australian SKA Pathfinder (ASKAP). A large-scale spin distribution has never been predicted by theories – and an unknown phenomenon like this presents a challenge that theories about the origins of the universe need to account for, and an opportunity to find out more about the way the cosmos works.